Matt is a Unix command-line toolkit for analyzing genomic sequences with focus on the down-stream analysis of alternative splicing events. Being a POSIX-style command-line toolkit, Matt runs on the terminal of any Unix-like system. Matt is modular: It comprises many commands, each of which tailored to one specific task. Combining commands allows the user to solve complex tasks: The whole is more than the sum of its parts. The central data structure Matt works on is tables, where rows correspond to objects, e.g., exons, genes, etc., and columns correspond to features of these objects. For performing a high-level analysis, the user of Matt usually goes through two phases. Though the main focus of working with Matt are the high-level analyses, Matt offers commands for data preparation/table manipulation within the same framework, too. The motivation for this is to prevent users from implementing many highly similar scripts by themselves for standard preprocessing steps like defining groups of exons/introns to be compared with each other, extracting genomic sequences or stratifying data sets. In addition, users can use and combine with Matt any other tool for manipulating tables, e.g., other scripting languages like Awk, Sed, etc. or even LibreOffice Calc or Excel. Some analysis commands produce reports as PDF documents, PDF graphics, or web pages summarizing the results. To make the work with Matt more efficient, many Matt commands are designed to be combined by piping. Exploiting this capability improves the work experience with Matt. where <ARGUMENT> is a necessary argument, but [<ARGUMENT>] optional and can be omitted. The order of arguments always matters; changing the order might cause errors or false results. This web page describes all commands and gives example calls. Both, this online documentation and the terminal help messages complement each other. Flexibility: the order of columns in tables is never important; Having specified the names of columns to be used for a specific analysis, Matt will search for these columns in the table automatically. This allows the user to apply Matt to very different tables without the need of re-ordering their columns. It should be emphasized that Matt does not assume any specific column structure, rather does the user choose specific columns with data necessary for the command the user wants to apply. As a consequence, when calling Matt commands the user needs to provide as arguments the names of these columns. For example, a user might want to do a differential motif enrichment analysis with the micro-exons table above and would list columns SEQ and GROUP, or, when the user wants to retrieve splice-site sequences of these micro exons, the user would use the same table but list columns START, END, SCAFF, STRAND. The order of columns in tables is never important, as the user always need to refer Matt to specific columns by their names. Not assuming specific columns in a specific order makes Matt flexible and applicable to almost any tab-separated table. For adding column names to tables yet without column names, e.g., like BED files, Matt offers the command add_header. Users are free to choose any column names they prefer. Though, it is recommended to use capital letters for all COLUMN NAMES. Further, column names should contain only alpha-numeric characters, A-Z, 0-9, and '_'. Generally, tables might contain any type of data representable as text, including long sequences. For improving the work experience with Matt, it is recommended that each column, whenever possible, should contain only one piece of information / value. Combining different values into one cell by concatenations, e.g., chr1:876123-877155, makes the single values, e.g., chromosome, start, end, inaccessible for Matt. Matt can process tables with Unix new-lines and Windows new-lines. Tables with old-style Mac new-lines or Dos new-lines need to be adapted first; See command chk_nls. When working with Excel, please save tables in format Windows Text. This online documentation of Matt commands introduces all commands and provides examples and explanations. For more details on commands you might want to checkout the terminal help-messages which Matt offers for all commands. where <ARGUMENT> is a necessary argument, but [<ARGUMENT>] optional and can be omitted. If you are primarily interested in performing analyses, you might want to make yourself familiar with the commands for analyses first, and later learn about the commands for data preparation. Description: Use this command to print a table to screen making visible new-lines. This helps to investigate which new-line characters are present in the table and how the table would need to be adapted to be processable by Matt. This might be necessary for tables with old-style Mac or Dos new-lines. prints this table making visible new-lines. Description: Use this command to check if a given table is processable by Matt. To be so, all rows of a table must have the same number of fields. This command lists row-number of rows with a wrong number of fields or reports that the table is correctly formatted. reports that this table is correctly formatted and, hence, processable by Matt. learn a PWM from aligned sequences of identical length. and turn it into the standard Matt format for PWMs. The first case is helpful when you have down-loaded a PWM or when you have extracted it from some document and want to use it with Matt. Matt tries to understand the structure of the table, e.g., if rows or columns correspond to positions. The second case is helpful when you have short sequences of identical length, e.g., splice sites or branch points, from which you want to learn a PWM (get the relative frequencies of letters at each position) and use it with Matt. prints this MBNL1 PWM with minimal probability 0.001 instead of 0 and alphabet A,C,G,T instead of A,C,G,U. For re-defining the alphabet, you could also directly edit the text file M037_0.6.txt. To save this PWM in Matt format for later use with Matt, re-direct the output into a file. Description: This command is tailored to the result table of SANJUAN (a program for estimating inclusion levels of alternative splicing events from RNA-seq data). These tables describe exons and already contain their start and end-coordinate, chromosome, and strand. With this command, you'll add Ensembl gene ids to the table, which are necessary for subsequent Matt analyses. Example: SANJUAN outputs differentially spliced exons in a table called CEs_clean.txt. will output a table like CEs_clean.txt with an additional column GENEID_ENSEMBL. It will duplicate rows (exons) for which SANJUAN did output several GENE_SYMBOLs; one row for each of the reported genes with its gene name and Ensembl gene id. Description: This command is tailored to the result tables of VAST-TOOLS. Use this command to transform the output table from VAST-TOOLS into Matt format and extract sub-sets of reported alternative splicing events. VAST-TOOLs reports skipped exons, retained introns, alt3, alt5 events in one output table together with estimated PSI values across several data sets. Matt allows you to retrieve form this table events of specific types (skipped exons, retained introns, Alt3, Alt5) or events that have a PSI value within a user specified range across all samples. Before you run a high-level analysis you might need to defined groups of events (e.g. up-regulated vs down-regulated skipped exons) with Matt function def_cats applied to the result table of get_vast. More information on the format of the VAST-TOOLs output table can be found here. extracts all intron retention events from vts_out.tab together with detailed information on PSI values (min, max, mean) across all samples, across samples -a kd1,kd2, across samples -b ctr1,ctr2, and dPSIs for the comparison of samples -a vs samples -b. In order to be considered in these calculations, PSI values need to have a minimum quality flag of LOW in samples -a and -b and N across all other samples. If for certain events no PSI values are left, NA is output. The output table ir_events.tab will have one additional column GENEID with the extracted gene IDs. Of course do the chromosome annotations in the VAST-TOOLs output need to match to those in the GTF file. Generally, the workflow is as follows: pre-process the output table of VAST-TOOLS for extracting PSI values with get_vast, define groups of events to be analyzed with def_cats, and eventually run a high-level analysis. Description: Use this command to get all distinct values of a column together with their number of occurrences. This command should be applied only to columns with categorical data. prints the three sub-types and their numbers of occurrences in table ir_events.tab. Description: Use this command to get all column names and their indices from a table. This command is useful to investigate the structure of tables and the kind of data in their columns. prints the column headers EXON_ID, START, END, SCAFF, STRAND, SEQ, ENSEMBL_GID, GROUP and their indices. Description: Use this command to retrieve one or several columns from a table. prints the entire columns START and END from table t1.tab. Description: For a given table with entities, find matching values from a second table. E.g., assume you have a table 1 with a column with gene ids and another table 2 with gene ids and gene names, then you can extract gene names from table 2 which match to the gene ids in table 1.
prints a table with one column GENE_NAME. Each row of this table corresponds to a row of t1.tab and it contains the GENE_NAME for the corresponding GENE_ID of t1.tab. Piping allows the user to concatenate both with command add_cols and augment table t1.tab. Description: Use this command to retrieve IDs of rows which occur in several tables. This command might be helpful if you want to determine the overlap of different data sets. Description: Use this command for concatenating entries of several columns. This command might be useful for constructing artificial row IDs, i.e., event IDs which might be necessary, e.g., for get_ovl if the table not yet contains event IDs. prints a table with one column EVENT_ID which contains in each row an event ID by concatenating START_END_SCAFF_STRAND. With command add_cols you might add this column with event IDs to the table t1.tab. Other separation symbols like the empty string '' or white space ' ' can be specified. Description: Use this command to retrieve rows (items) from a table. Filters allow the user to select specific rows, i.e., rows which have specific values (numeric or categorical) in some of the columns, or whose vales are empty (empty string). prints the rows from t1.tab with START in 1 to 5 Mio and STRAND is NOT +. Description: Use this command to randomly draw rows from a table. This command might be useful when you want to sub-sample data sets. prints 500 randomly drawn (seed 3628929065) rows (without replacement) from ir_events.tab. You might want to save these events into a file for later use. Description: Use this command to add columns to existing tables. Columns to be added might be newly constructed or retrieved from another table with get_cols. will add the column EVENT_ID from event_ids.tab to the right end of table t1.tab. Combining both commands using piping is more efficient. Description: Use this command to add column names (entire table header) to a table yet without header to make it processable with Matt. adds three column names as header to the file exons.bed directly without printing it to screen. Description: Use this command to add a column with a range index increasing for each row. prints t1.tab with extra column ID with index starting at 0 and increasing in each row. Description: Use this command to add rows to existing tables. You might want to add rows of one table to another table, e.g., to join data sets into a single table. will add all rows from t1.tab to the bottom of t1.tab, which does not look very meaningful. Important: Both tables must have the same number of columns with the same column names, but their order can vary as Matt will re-order columns automatically if necessary. Description: Use this command to add one column with a constant value across all rows to a existing table. You might use this command to add a column containing some kind of group IDs (e.g., up_regulated) to tables which you later join into one table. will print table t1.tab to screen with a additional column DATE containing the value 22.02.2017 in all rows. Description: Use this command to change labels (categorical entries) in a column of a table. You might use this command if you have a column with group IDs and want to change these IDs / labels. will print table t1.tab to screen where in column EXON_ID ex1 is changed for ex11, and ex2 for ex22. Description: Use this command (define categories) for creating a new column with some kind of group IDs. Generally, rows of table corresponds to events, while columns correspond to their features. Hence, you define group IDs (one for each row) wrt. entries in the feature columns using the same constraint syntax as used with command get_rows. This command is important as many analyses essentially compare some groups of items (e.g. groups of exons, introns, sequences, or more), hence, the user needs to defined the groups to be compared. will output a table with column GROUP2 with group IDs g1, g1, g2, g3, g1 categorizing each micro exon in table t1.tab wrt. the defined constraints. Description: Use this command to remove columns from a table changing the original table. will print a table with columns DATE and STRAND to screen and remove these columns from the original t2.tab. Be careful: The original table will be changed by removing columns. This might lead to undesired data loss. Description: Use this command to rename columns of tables. You might use this command before you want to join by-column two tables which have some column names in common. Tables must not contain column names several times. Each column needs to have a unique name. will print t1.tab to screen with column names SCAFFOLD instead of SCAFF and STRAND2 instead of STRAND. Description: Use this command to output in FASTA format sequences from a table. You might use this command if you want to run other software on sequences which you have obtained with Matt. Often, software for analyzing sequences expect FASTA input format. will print the sequences from column SEQ into FASTA format where values in column EXON_ID will be used as sequence IDs. If the table not yet contains a column with kind of sequence IDs, you might want to use conc to construct them. Description: Use this command to retrieve genomic sub-sequences from FASTA files. Usually, you'll have a table specifying genomic coordinates (e.g. START, END, SCAFFOLD/CHROMOSOME, STRAND) and you want to retrieve genomic sequences with these coordinates (e.g., sequences of exons, introns, genes, splice sites or any other genomic entity) from a FASTA file (which contains all sequences of the entire genome). The command get_seqs has three modes making it easy to retrieve different genomic sequences wrt. to the coordinates. 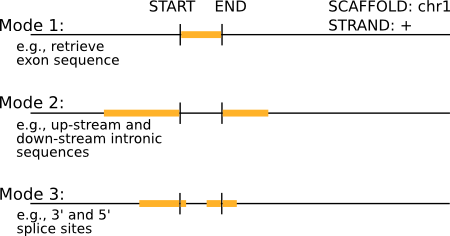 Schematic view of positions of START and END coordinates and the four length arguments for mode 3. Sequences from - strand get reverse-complemented automatically and up/down-stream sequences come from the up/down-stream regions wrt. START end END coordinates. will extract for all micro exons in t1.tab the up-stream intronic sequences of length 20 and the down-stream intronic sequences of length 10 and print these sequences as a table with columns SEQ_UP and SEQ_DOWN. The scaffold/chromosome IDs in column SCAFF of table t1.tab must be the same as used in Hsa_genome.fa. Using piping, you can add the retrieved sequences directly to the table t1.tab as get_seqs outputs the sequences as a two-column table. Description: Use this command to plot a PDF for visually comparing two motifs (position weight matrices) of the same length. Motifs can be given either by tables describing position weight matrices (get_pwm) or by tables containing sequences (aligned, all of same length) from which Matt will estimate position weight matrices. generates the PDF mbnl1_vs_a2bp1.pdf which shows the motif plots (plot_motif) for both PWMs and in the center a diagram showing at each position the log2-ratio of probabilities of each nucleotide. Description: Use this command for retrieving 75 features of interest for exons. Exons need to be described by a table with basic information like their genomic coordinates and a gene ID of genes the exons belong to. If the table does not yet contain gene IDs, you might use the command retr_geneids for extracting gene IDs from any GTF file for given genomic events, like exons, introns, genes. GENE BIOTYPE: Splicing of exons and introns in coding vs non-coding genes might underlie different mechanisms. LENGTH: Exon and intron length, as well as the relation of exon length and the lengths of its neighbor introns, and intron length to the lengths of its neighbor exons might indicate different splicing mechanisms (e.g., exon vs intron definition, Amit et al., DOI: 10.1016/j.celrep.2012.03.013), or categories of exons like micro-exons or long introns. The following BP and splice-site features: They are proxies for the binding specificity respect to the U2 snRNPs and other core spliceosomal components. The lower this binding specificity is, the less the intron/exon will be recognized. SF1 BINDING SCORES: Is an approximation of the branch-point strength thought of impacting the efficiency of splicing. DISTANCE PREDICTED BRANCH POINTS TO 3SS, NUMBER OF PREDICTED BRANCH POINTS, SEQUENCE SCORE OF BRANCH POINT SEQUENCE, PYRIMIDINE CONTENT, LENGTH OF PYRIMIDINE TRACT, OFFSET OF PYRIMIDINE TRACT FROM 3SS, PYRIMIDINE TRACT SCORE: are used for the classification of branch points by Corvelo et al., DOI: 10.1371/journal.pcbi.1001016; Thus they are potentially interesting features to be considered when studying and comparing introns or neighbor exons. MEDIAN EXON/INTRON NUMBER: of transcripts a specific exon/intron occurs in; Might indicate if exons/introns preferentially occur in transcripts with few or many exons/introns. (RELATIVE) RANK: of exon or intron. Might reveal if exons/introns preferentially occur at the start, interior, or end of transcripts. 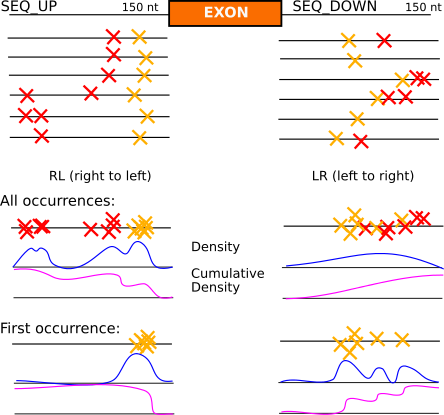 PROPORTION OF TRANSCRIPTS: where exon/intron occurs as first, internal, or last exon/intron, or within UTRs. Again, might indicate bias of the location of exons/introns in transcripts. CO-OCCURRENCES: of exons/introns in same transcripts. Might indicate of studied exon/introns tend to co-occur in transcripts. For detecting features discriminating sets of exons, the command cmpr_exons is more suited. writes a table with columns containing exon feature and extracted sequences of the exons, up/down-stream introns, and splice sites. If only one or a few features are of interest, users can apply get_cols and extract specific feature columns only. It is recommended to use GTF files with genome annotation from Ensembl, as Matt is tailored to their structure. Description: Use this command to determine the GC content of genomic sequences. will print a table with one column SEQ_GCC containing the determined values of the GC content. Any letter not A, C, G, T, U, a, c, g, t, u will be completely neglected from the computation of the GC content. Description: Use this command to retrieve 50 features of interest for introns. Introns need to be described by a table with basic information like their genomic coordinates and a gene ID of genes the introns belong to. If the table does not yet contain gene IDs, you might use the command retr_geneids for extracting gene IDs from any GTF file for given genomic events, like exons, introns, genes. Motivations and references for these features are listed in the description of command get_ifeatures. For detecting features discriminating sets of introns, the command cmpr_introns is more suited. writes a table with columns containing the feature values and extracted sequence of intron, up/down-stream exon, splice sites. Description: Use this command to predict hits in sequences with a motif position weight matrix model (PWM). will estimate a simple background PWM from all sequences (being identical to a homogeneous Markov model of order 0), and predict MBLN1 hits at positions where the likelihood ratio MBLN1 PWM vs. background PWM is at least 10 or higher, i.e., where it is at least 10 times more likely to actually have a MBNL1 binding site than having no MBNL1 binding site (background). The command prints a table with columns SEQ_ID, START, END, STRAND, HIT, LOGSCORE describing the hits. Description: Use this command to plot positional distributions of hits of motif position weight matrices (PWMs) across sequences. This command involves predicting hits of PWMs as well. Hence, you need to specify the input sequences, the PWMs, and information on how hits should be predicted. 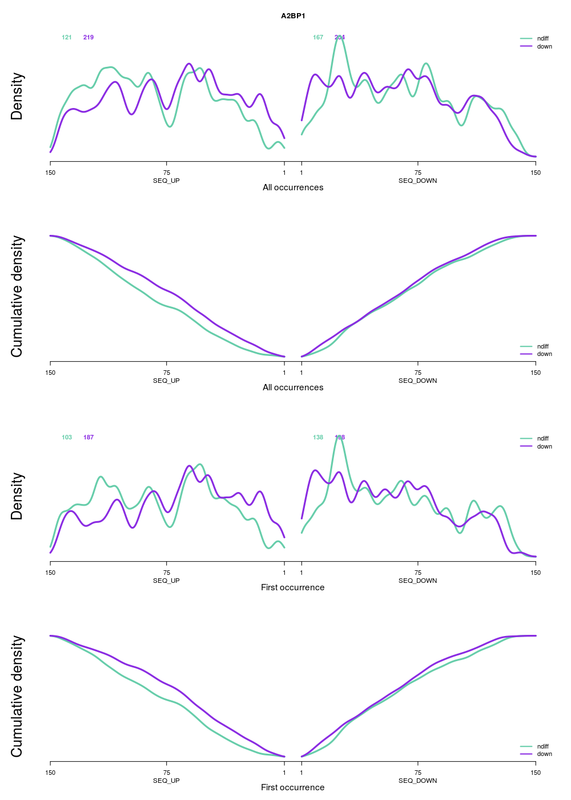 The parameter LR and RL defines how the cumulative distributions will be plotted (LR: increasing from left to right, RL: increasing from right to left) and which are the first positions per sequence (LR: first position = left most position, RL: = right-most position). creates a folder pwm_profiles and therein a website 0_all_results.html with all results and a table ydiff_scores_of_dens_and_cdens.tab which contains differences (between the densities down vs. ndiff) for identifying the PWMs for which the densities are most different. If reference group is none then differences are determined wrt. zero line / diagonal with slope 1. Description: Use this command to predict hits in sequences with Perl regular expressions. will search for possibly overlapping hits of ACCG or GGC or GCC or GCCT (case insensitive) and outputs them as a table with columns SEQ_ID, START, END, STRAND, HIT. The argument single states that Matt should not search in the reverse-complements. If several hits start at the same position, only the first gets reported according to their order in the call. 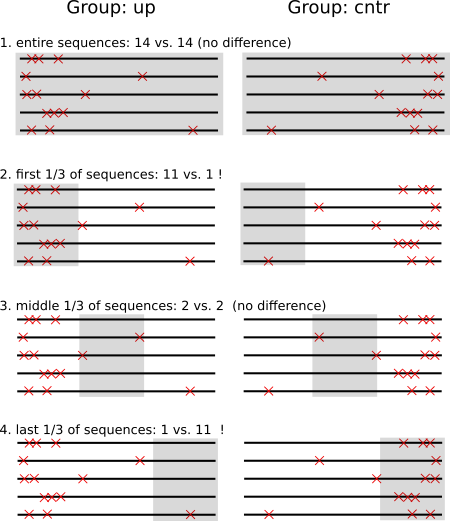 If motifs are of variable length, the longest match will be reported only. Description: Use this command to plot positional distributions of hits of Perl regular expressions across sequences. You need to specify the input sequences, and the regular expressions. 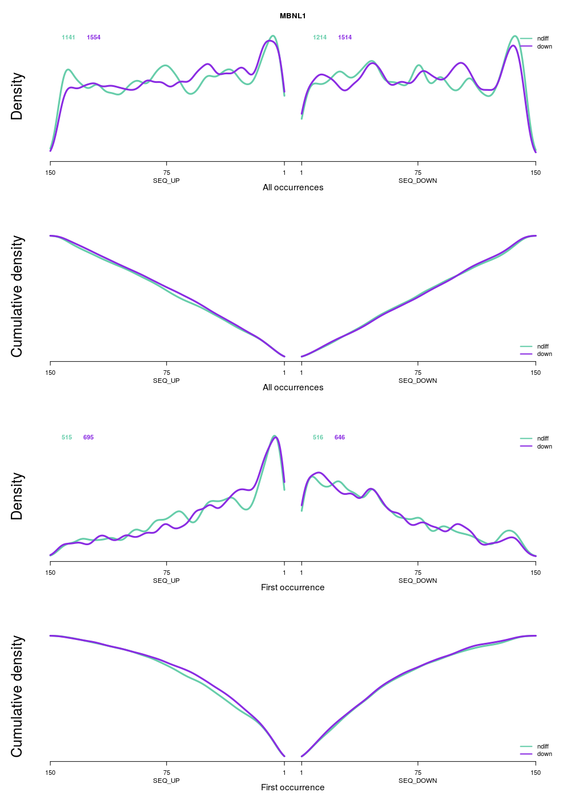 The parameter LR and RL defines how the cumulative distributions will be plotted (LR: increasing from left to right, RL: increasing from right to left). This parameter also defines the first position per sequence (LR: first position = left most position, RL: = right-most position). creates the folder regexp_profiles and therein a website 0_all_results.html with all results and a table ydiff_scores_of_dens_and_cdens.tab which contains differences (between the densities down vs. ndiff) for identifying the regular expressions (patterns) for which the densities are most different. Description: Use this command to determine lengths of sequences. will print a table with one column SEQ_LENGTH with the lengths of the sequences in table t1.tab in column SEQ. Description: Use this command to estimate the splice site strength of 3' and 5' splice sites using maximum-entropy models (DOI: 10.1089/1066527041410418). Often you'll start with a table of exons or introns. First, you need to retrieve the sequences of the 3' and 5' splice sites. For this, you might use the command get_seqs (mode 3). will estimate the strength of the splice sites and output them as a table with two columns STRENGTH_3SS and STRENGTH_5SS. Description: Use this command to create a motif plot as PDF similar to sequence logos for a given position weight matrix model (PWM) or from a set of aligned sequences of identical length. For obtaining PWMs, re-defining their alphabet or setting a minimum probability, you might use the command get_pwm. will create a PDF human_nova2_pwm_motifplot.pdf visualizing the probabilities of the nucleotides at each position, the consensus sequence (letters at the top of the bars), and the information content at each position. Description: Use this command to statistically test for enrichment/depletion of motifs comparing two sequence sets. The motifs are defined by position weight matrices (PWM). The sequences and the information on the PWMs need to be given as tables. This command first predicts PWM hits in the two sets of sequences and then applies a permutation test for estimating p-values for the enrichment/depletion. will perform 6 comparisons: (pwm1, pwm2, pwm3) x (up vs. cntr, down vs. cntr), and will output a table with all information on these comparison. This table gets written into file results.tab by re-directing the output. Instead of inferring the background model (argument INFER_BGMODEL), you can provide a background PWM or predict hits without background model only using the foreground PWM. In the latter case, the thresholds defined in table pwms.tab must be defined wrt. the log-score of the PWM, e.g, -10 or -8. Test for positional differences of hits: The above described procedure considers the number of PWM hits across entire sequences. Imagine we predict 14 hits in the sequences of group up close to their left end, and 14 in sequences of group cntr close to their right end. Considering entire sequences, we won't find this positional difference; though this difference might be interesting from a scientific point of view. and reports p-values for all four tests. Number and length of sequences: Sequences can be of variable length and the two sequence sets might consist of a different number of sequences. Matt normalizes the number of found PWM hits in each sequence wrt. its length and within each data set wrt. its size (number of sequences). Avoid false positives: Normalizing the number of PWM hits might result in false positive findings. For example, if hits actually occur only in a specific sub-region of the sequences, e.g, only in the 5'-ends of introns, and if the sequence in one set have a very different length than sequences in the other set. Testing these sequences which are of very different length but contain the same number of PWM hits, after normalization it will look if there were more hits in group cntr (per sequence position) than in group up. In this or similar cases, it is recommended to cut the sequences to the regions (highlighted) where you actually expect hits. All examples above consider the number of hits. Depending on the research question, it might be more reasonable to consider the fraction of positive sequences in each group of sequences. Positive sequences are those which contain a minimum number of predicted hits. For selecting the applied test statistic, use argument <MODE>. Description: Description: Use this command to statistically test for enrichment/depletion of motifs comparing two sequence sets. The motifs are defined by Perl regular expressions. The sequences and the information on the regular expressions need to be given as tables. This command first predicts exact matches of the regular expressions in the two sets of sequences and then applies a permutation test for estimating p-values. This command is very similar to test_pwm_enrich but predicts motif hits with Perl regular expressions get_regexp_hits. will perform 4 comparisons: (protA and protB) x (up vs. cntr and down vs. cntr), and will output a table with all information on these comparison. This table gets written into file results.tab as we re-direct the output. Test for positional differences of hits: The above described procedure considers the number of hits across entire sequences. Imagine we predict 14 hits in the sequences of group up close to their left end, and 14 in sequences of group cntr close to their right end. Considering entire sequences, we won't find this positional difference; though this difference might be interesting from a scientific point of view. Number and length of sequences: Sequences can be of variable length and the two sequence sets might consist of a different number of sequences. Matt normalizes the number of found hits in each sequence wrt. its length and within each data set wrt. its size (number of sequences). Avoid false positives: Normalizing the number of hits might result in false positive findings. For example, if hits actually occur only in a specific sub-region of the sequences, e.g, only in the 5'-ends of introns, and if the sequence in one set have a very different length than sequences in the other set. Testing these sequences which are of very different length but contain the same number of hits, after normalization it will look if there were more hits in group cntr (per sequence position) than in group up. In this or similar cases, it is recommended to cut the sequences to the regions (highlighted) where you actually expect hits. Description: Use this command to apply calculations along rows. which creates a table with column MEAN. You can use any mathematical expression which is available within Perl. Column names in expressions are used like variables. Mathematical expressions must always be put inside ' '. Description: Use this command to apply some pre-defined calculations, like summation, along columns. If the table contains columns with group labels, this commands allows to apply calculations per group. sums over columns V1 and V2, considering entries in column A being group labels and outputs sums per group. sums over columns V1 and V2, considering entries in columns A and B being group labels and outputs sums per group. will apply a permutation test (100000 repeats) and test for significant differences between the two exon groups down vs. ndiff wrt. 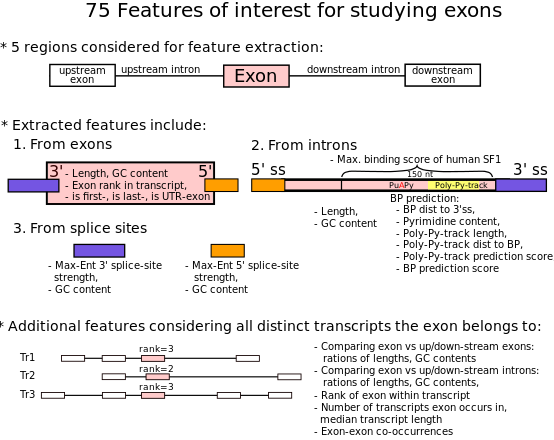 to the features exon length, exon GC content, and gene type. It also will test whether the exons of the two groups (down vs. ndiff) co-occur differently, e.g., whether they co-occur heavily in one group in a few transcripts, and much less (spread among many transcripts) in the other group. The command will print a text report (NOT a table) with all details and results. Co-occurrences: each row of the table corresponds to one element (in our case to an exon). Exons might be clustered, e.g., all exons occurring in the same transcript belong to one cluster. Exons which occur in the same cluster co-occur with each other. You might identify the clusters by giving them unique cluster IDs. In the example, cluster IDs are transcript IDs. Then, there need to be a column in the table which contains information about the clusters each element (exon) occurs in, e.g., IS_IN_TRS. This information must be given by a colon-separated list of cluster IDs, e.g., tr1:tr10:tr155 for exon5 encodes that exon5 actually occurs in these three clusters (transcripts). If a exon does not occur in any cluster, this list is empty. Description: This is a utility command for automatically extracting gene IDs from gene annotations (GTF files) for genomic events like genes, exons, introns, etc. retrieves for all exons in exons.tab gene ids from Hsa19.gtf, where gene ids are taken from field gene_id of Hsa19.gtf. Description: This is a utility command for extracting/checking scaffold/sequence/chromosome IDs in FASTA, FASTQ, GFF, GTF files. will print all IDs of human chromosomes. Description: Use this command to determine the most likely kmers under a position weight matrix model (PWM). Either obtain the top N (integer ≥1) kmers or the most likely k-mer which together account for P (0<P<1) percent of the total binding specificity (probability) as encoded by the PWM. This command might help if you want to search for PWM hits but don't want to specify a threshold on the PWM log-score. In this case, you could determine the most likely kmers from a PWM and use these as a Perl regular expression and search for exact hits. prints the 5 most likely kmers under the MBNL1 PWM. prints the most likely kmers which together account for 50% of all binding specificity. Description: This command allows the user to make-unique a table, i.e., omitting rows with replicated entries in specific columns. Description: This command allows the user to permute randomly nucleotides within sequences. outputs a table with column SEQ_PERM with sequences from SEQ with randomly permuted nucleotides. Description: Use this command to print a tab-separated table nicely aligned to screen. This command is especially useful for getting an overview of the contents of tables which contain long strings with different lengths. prints t1.tab where all cells get extended or truncated to 5 characters and with 3 blanks between columns. Use piping and less to see large table. Description: Allows the user to retrieve RNA-seq data from the Gene Expression Omnibus (GEO), a public repository where many researchers store their RNA-seq data related to their publications. Having at hand the GEO accession numbers of RNA-seq data sets, this command downloads the SRA archives, extracts RNA-seq reads as FASTQ or FASTA files, and, if wanted, renames the extracted FASTA/FASTQ files as specified by the user. Description: Use this command to sort rows of a table according to values (numeric or alpha-numeric) in a distinct column. will print t1.tab to screen where lines are sorted wrt. START. will do the same but sort decreasingly. Description: Use this command to stratify data sets, e.g., if you want to compare two sets of exons and want to make sure their length distributions are similar, you might first stratify these two sets of exons and then apply perm_test. Stratification can be performed wrt. any numerical feature. will stratify both groups such that their GC content distributions are similar. The reference group is ndiff. The algorithm searches for each ndiff exon one exon from the group down which a similar value in column GCC (± 0.05). Each pair of matched exons will get into the final result table. All exons from both groups without matching pair will be neglected. The command outputs a table like exons.tab reduced to the stratified exons. With col_calc you may check how well the means or medians of the groups agree after stratification. Recommendation: use the GTF files from Ensembl as they also contain information on the gene types (coding, non-coding, etc.) as these information will get used as well. will compare exons down vs. ndiff and leave untouched exons from group up. The argument 150 specifies the length of the up-stream and down-stream intronic regions which should be searched for SF1 hits. It will generate the output folder down_vs_ndiff and place therein a table with all exons (down and ndiff) and the extracted exon features. It will also place therein a PDF document summary.pdf containing all details of the comparison. Hint 1: You might first stratify the sets of exons with stratify and then apply cmpr_exons. Hint 2: You might chose colors for the box plots of the PDF report. See help message of cmpr_exons for getting help on this. Hint 3: DATASET[down,ndiff]: the last group specified should be the reference group (like non-differentially spliced). Hint 4: DATASET[down,ndiff] compares set down vs. ndiff, DATASET[down,up,ndiff] compares down vs. up, down vs. ndiff, up vs. ndiff. will compare introns down vs. ndiff and leave untouched introns from group up. The argument 150 specifies the length of the 3'-end of the introns which should be searched for SF1 hits. It will generate the output folder down_vs_ndiff and place therein a table with all introns (down and ndiff) and the extracted intron features. It will also place therein a PDF document summary.pdf containing all details of the comparison. Hint 1: You might first stratify the sets of introns with stratify and then apply cmpr_introns. Hint 2: You might chose colors for the box plots of the PDF report. See help message of cmpr_introns for getting help on this. Hint 4: DATASET[down,ndiff] compares group down vs. ndiff, DATASET[down,up,ndiff] compares down vs. up, down vs. ndiff, up vs. ndiff. Description: Allows the user to produce motif RNA-maps for comparing enrichment of binding motifs of RNA/DNA binding proteins for different groups of exons or introns. Motifs can be defined as position weight matrix models (PWMs) or Perl regular expressions. This command will extract all necessary sequences from the genomic proximity of given exons/introns, predict hits of the specified motifs therein, and compute motif enrichment scores. If chosen by the user, a permutation test is applied for estimating p values and regions with significant differences in motif enrichment will be highlighted in the motif RNA-map. For each map, there are two versions, one with a data coverage section, and one without. The data coverage section shows the data overage along the map, which might be less then 100% if the data set contains exons/introns shorter than the specified exon/intron sections to be visualized. The motif RNA-maps are ordered according to largest differences of motif enrichment scores; Maps with largest positive differences come first, maps with largest negative differences last. The reference group for computing differences is always the last group specified in the program call. The following call produces a NOVA2 motif RNA map with a sliding window of length 31 which slides up to position 35 into exons and up to position 135 into introns. Regions with significant enrichment as compared to the reference group ndiff are highlighted. Hint1: When you use the arguments -p or -fdr then statistical testing is performed and regions with significant enrichment/depletion are highlighted. The last group in GROUP[up,down,ndiff] is the reference group for testing, e.g., here up vs ndiff and down vs ndiff. Hence, highlighting will be plotted only for groups up and down, never for ndiff. Hint2: For statistical testing a permutation test is invoked. When testing many motifs, then this may increase the runtime considerably. In this case, you may omit the statistical test (omit arguments -p, -fdr), scroll through the PDF report focusing on the first and last motif RNA maps, and re-run this analysis with statistical test for a few motifs which gave you interesting findings. at once without needing to specify these k-mer motifs or download the CISBP-RNA binding motifs. The following call produces motif RNA maps for all CISBP-RNA IUPAC binding motifs with a sliding window of length 31 which slides up to position 35 into exons and up to position 135 into introns. See command rna_maps for an example motif RNA map. Hint1: When you use the arguments -p or -fdr then statistical testing is performed and regions with significant enrichment/depletetion are highlighted. The last group in GROUP[up,down,ndiff] is the reference group for testing, e.g., here up vs ndiff and down vs ndiff. Hence, highlighting will be plotted only for groups up and down, never for ndiff. Description: Use this command to test for enrichment/depletion with all approx. 300 PWM motifs from the CISBP-RNA database. will compare down vs. ndiff and up vs. ndiff. During each comparison and for each CISBP-RNA binding PWM, it will predict binding sites in all sequences and apply a permutation test to determine p-values for the differences wrt. the number of predicted hits in both data sets. It will generate a table containing all results (including number of predicted hits per group, test statistics, p-values, information about the binding motifs (PWMs) like associated RNA-binding protein). For PWMs for which significant enrichment/depletion of hits was found, test_cisbp_enrich also generates PWM profiles invoking get_pwm_prof. and reports p values for all four tests. Hint 1: You might run test_cisbp_enrich with a sub-set of CISBP-RNA PWMs. See help message for details on this. All examples above consider the number of hits. Depending on the research question, it might be more reasonable to consider the fraction of positive sequences in each group of sequences. Positive sequences are those which contain a minimum number of predicted hits. For selecting the applied test statistic, use argument -m.
The examples contain many explanations and therefore appear lengthy. The more familiar the user is with Matt, the easier and faster the work experience will become. and we want to extract exon features for all exons of this data set and compare the three sets of exons wrt. these features. by checking, e.g., column names of the given table. The table data.tab has 7 columns containing information on alternative splicing events as output from Vast-Tools. Column FullCO was not put on this website to save space. Column TYPE encodes the type of alternative splicing events. We need to use command get_vast later which works with Vast-Tools standard types of alternative splicing events which are: S, C1, C2, C3, MIC, IR-S, IR-C, Alt3, Alt5. Table data.tab contains these standard types but also other types like S*, C1*. Hence, we adapt all labels to the standard types with command chg_labs. The commands get_efeatures and cmpr_exons expect information on exons like their start and end coordinate but table data.tab does not contain this information, yet. The command get_vast is specifically designed for extracting this information from VAST-TOOLs output tables. It outputs an augmented table, from which we select only exon events by re-directing this table to the command get_rows. The final output table gets re-directed into file exons.tab. Checking how table exons.tab looks like by listing its column names. To verify that exons.tab contains only exons, you could also apply col_uniq to column TYPE again. which are necessary for commands get_efeatures and cmpr_exons. Here, we use command get_match which takes as input a second table containing a mapping EVENT_ID to ENSEMBL_GENEID (mapping_EVENT2GENEID.tab) and outputs for each EVENT_ID in column EVENT of table exons.tab the corresponding GENEID. The resulting table (one column) gets added immediately to table exons.tab exploiting piping. Alternatively, we could use the command retr_geneids to extract gene IDs from a given GTF file for splicing events. The following commands will append to the table exons.tab a column ENSEMBL_GENEID. Yet another option is to use the command get_vast with arguments -gtf and -f. In this case, it automatically extracts gene IDs from the given GTF and appends a column GENEID, which we rename to ENSEMBL_GENEID. to get an idea about the size of the exon sets. Table exons.tab now contains for all exons information about their genomic coordinate, gene, and their exon features including sequences like exon sequence, splice site sequences, sequences of up/down-stream introns. All these information can be used as input for further analyses, e.g., with R. The extracted sequences might be of interest for further analyses like de-novo motif search etc, which often expect their input as FASTA files. Using the command extr_seqs, you might extract sequences from specific columns of exons.tab in FASTA format. The sizes of the exon sets are: AS_noNeural=10465, NEURAL-DOWN=631, NEURAL-UP=1046. 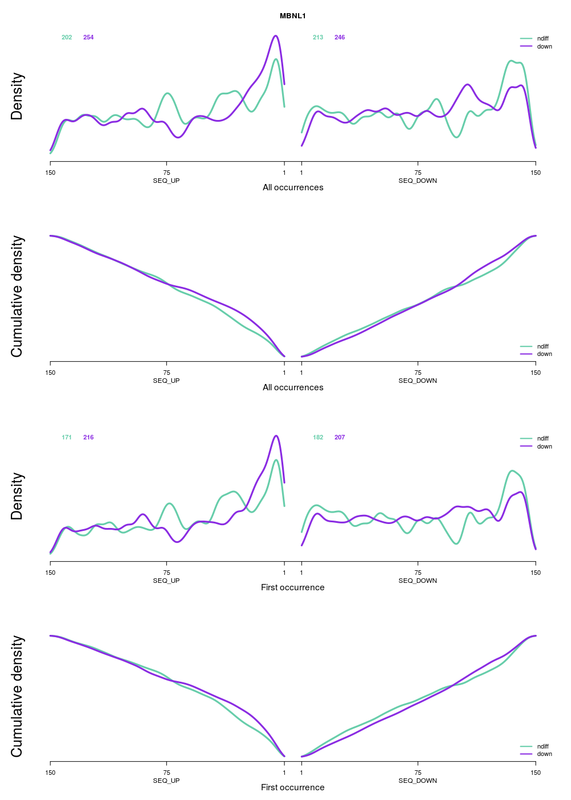 Hugh groups like AS_noNeural are unnecessary for comparing exon sets and would slow down analysis. Hence, we sub-sample 2000 AS_noNeural exons with rand_rows and create a new table exons_testsets.tab. The table exons_testsets.tab should be used as input for command cmpr_exons. It is important to know that cmpr_exons will extract features for all exons of its input table and append them to the input table. As a consequence, the input table must not contain already columns with identical column names because column names in a table must be unique. Hence, from exons_testsets.tab we select only the important columns and neglect the already added columns with exon features. Checking the number of exons in the final table exons_testsets.tab confirms that the sampling worked as expected. With GROUP[NEURAL-UP,NEURAL-DOWN,AS_noNeural] we select the groups which should be compared, i.e., all pair-wise comparisons are done: NEURAL-UP vs. NEURAL-DOWN, NEURAL-UP vs. AS_noNeural, and NEURAL-DOWN vs. AS_noNeural. Putting AS_noNeural in the last place will give us box plots which contain the group AS_noNeural as reference group. All output gets written into folder cmpr_1, where you find a summary in form of a PDF document with all details on the comparisons and all graphics in sub-folder summary_graphics for later use. The set of AS_noNeural is much larger than the other sets. Hence, we randomly sample 2000 AS_noNeural exons and construct a new table with them and all NEURAL-DOWN and NEURAL-UP exons. The command get_seqs is the utility command for retrieving different types of sequences. For a given genomic region, e.g. an exon in this case, it allows to retrieve the up-stream and down-stream sequences (*Mode 2 in its help message) and will output these as a table with two columns SEQ_UP and SEQ_DOWN. Here we define as length for the up- and down-stream region 200 nt and add the columns with sequences directly to table exons_testsets.tab. The command add_val allows the user to define groups and generate a column with group labels. The stars encode the level of significance, i.e., * p-value ≤0.05, ** p-value ≤ 0.01; *** p-value ≤ 0.001. From the results we find that neural exons (regardless of their size are highly enriched in TGC. This will create a web page in folder regexp_profiles which you can study using any web browser. This web page looks as follows. 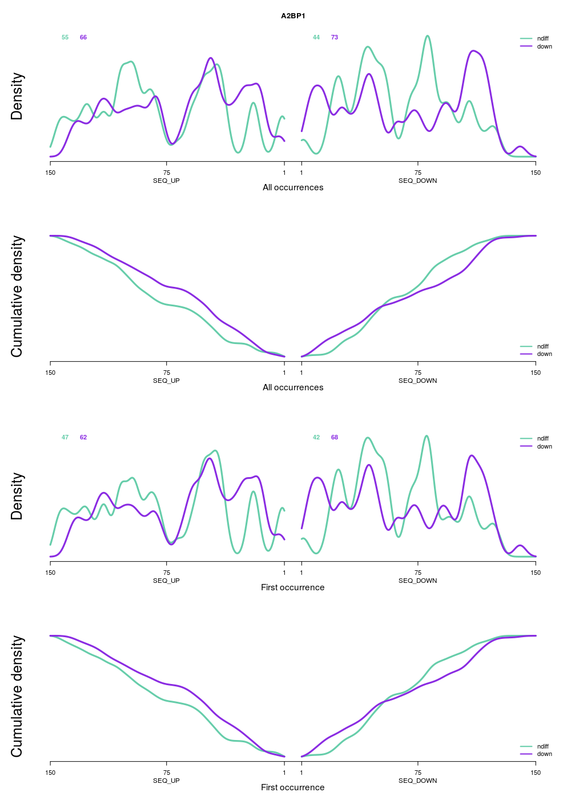 It should be mentioned that these plots show densities and cumulative densities. Hence, they give information about the position of TGC hits across sequences; but they do not give information about the absolute number of hits. The plots show that TGC hits in the up-stream intronic regions of neural micro exons (red and blue lines) are clearly concentrated closer to the 3' splice site as in case of neural exons and non-neural exons. A Shell script with all commands and explanations is available. Commands therein can be copy'n'pasted to a Shell where Matt is available. Extraction of skipped exons from vast-tools output table, which contains skipped exons, retained introns, and alternative 3' and 5' splice sites. Definition of three groups of skipped exons according to their delta inclusion levels (∆PSI) for Nova2 KD vs. WT: silenced (∆PSI≥25), enhanced (∆PSI≤-25), unregulated (-1≤∆PSI≤1). 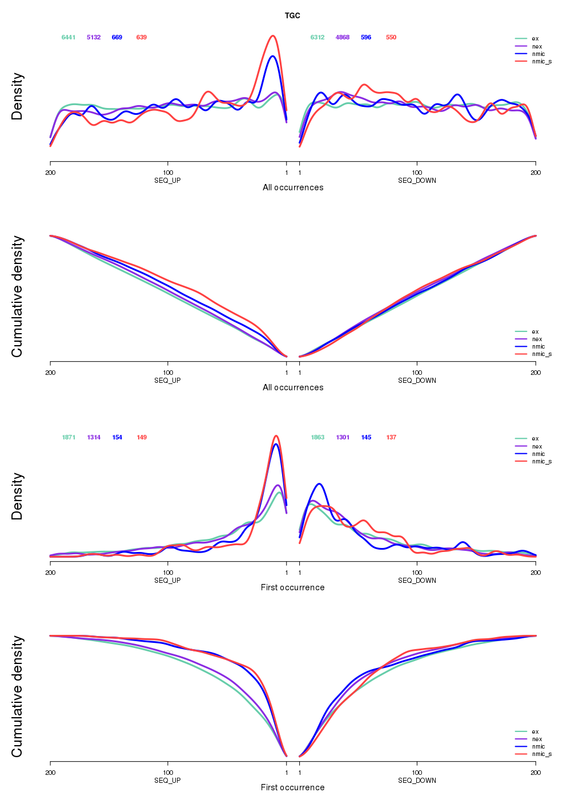 Extraction of exon-related features, and statistical comparison of feature distributions with the Mann-Whitney U test for the detection of discriminative features. Generation of motif RNA-maps for all approx. 340 RNA binding proteins with IUPAC binding motif from CISBP-RNA. a summary report (PDF) with all motif RNA-maps. Each map is generated in two version, one containing a data coverage section and one which does not contain such a section. Generation of a specific motif RNA-map with a Nova2 binding motif derived from known Nova2 binding motifs, with highlighted regions of statistically significant (FDR≤0.01) different Nova2-motif enrichment. a summary report (PDF) with all (in this case only one) motif RNA-maps. Each map is generated in two version, one containing a data coverage section and one which does not contain such a section. Statistical enrichment analysis in these extracted sequences with all CISBP-RNA RNA binding proteins with PWM binding motifs. Matt can be extended by new commands/functions. Extensions can be implemented in any scripting/programming language. Though, the easiest way might be to use Perl as Matt is mainly implemented in Perl and already includes a Perl module with utility functions for working with tables. A template script new_command.pl showing how Matt commands are usually implemented in Perl is available in sub-directory abilities of the Matt installation directory. This Perl script implements already the usual structure and can be extended quickly to a full implementation of a new Matt command. This template script new_command.pl contains detailed comments/help explaining how it needs to be extended. It also contains instructions for implementing Matt commands in other scripting/programming languages. 1. Which letters do genomic sequences contain? Usually, they contain A, C, G, T. All CISBP-RNA motifs are defined wrt. these letters. Hence, when you run test_cisbp_enrich, your sequences must contain A, C, G, T, and maybe N but all potential binding positions containing at least one N will be neglected. Whenever you extract sequences with, e.g., get_seqs and your FASTA file contains A, C, G, U, then the extracted sequences will contain these letter as well. Whenever you use your own position weight matrices (PWMs), these might be defined wrt. A, C, G, U. In this case, when you want to use these PWMs with command test_pwm_enrich then your sequences should be defined wrt. A, C, G, U as well. 2. Which column names do my tables need to have? You are free to choose any column names you prefer, but they should be alpha-numeric and, if possible, upper-case: A-Z, 0-9, and '_', and they should be meaningful. When applying Matt commands to your tables, often you need to specify the column names of your tables to which you want to apply Matt. E.g., get_seqs expects your table to contain a column with start coordinates and another with end coordinates. You can call these columns START and END, but any other name is possible. 3. I don't get a PDF report from cmpr_exons or cmpr_introns. These PDF reports are generated with pdflatex using the following packages. Please make sure all of them are available on your system. 4. I get strange errors when extracting sequences from a FASTA. ... uninitialized value $chr in substitution (s///) at get_seqs.pl line 118, <$fh> chunk 954. ... uninitialized value $seq in substitution (s///) at get_seqs.pl line 119, <$fh> chunk 954. ... uninitialized value $seq in transliteration (tr///) at get_seqs.pl line 120, <$fh> chunk 954. ... uninitialized value $chr in hash element at get_seqs.pl line 121, <$fh> chunk 954. We saw these errors when the FASTA file was stored and read from a pen drive/USB stick. Copying the FASTA to the local hard drive solved this issue. Matt builds on the great work of others. Hence, when publishing results which you have obtained with Matt, please follow these rules for citation. whenever you publish results obtained with Matt's command test_cisbp_enrich or when you have used any of the CISBP-RNA binding motifs in sub-folder data_external/cisbp_rna of Matt installation. Matt uses great tools of others.